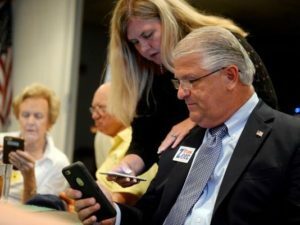 Indian River County voters returned Tim Zorc to a second term on the County Commission to continue his fight against All Aboard Florida and Vero Electric. Tim Zorc won his District 3 re-election fight, edging out retired Indian River County Fire Rescue Capt. Joe Earman. Zorc campaigned heavily on his record of favoring a special counsel adept at the legal challenges with fighting the high-speed passenger train. His support of lawsuits and legal action against Vero Electric on behalf of customers living outside the city limits also drew fire from the three challengers trying to oust him, but Tim Zorc said voters backed his stance.